A non-outsourced review to die for …. It would be wrong to acquit the author on grounds of ignorance. Despite being marginally informed, Ed Yourdon knows exactly what he is doing for his readership, especially when he makes their spines tingle by invoking denizens of their anxiety closet: turbaned job-stealing foreigners, underpaying jobs at Wal-Mart, etc. The truth is that Yourdon is heir to the itinerate mages who brandished lunar eclipses to cow neolithic hunter-gatherers. This entry was posted in Offshored and out on November 30, 2004 by Espen. Bob Cringely has an interesting idea: That Wal-Mart could become a WiMax operator. This makes sense – and leads me to wonder who the aggregator could be in Europe. Someone with continental presence, a strong network, many locations and the coffers necessary to outcompete the regular telcos. Some of the oil companies, possibly, using gas stations? There is no Wal-Mart in Europe, the retailers are market segmented, though some chain collaboration might work. McDonalds? Lack the network and the regulatory moxie. Hmmmm….. This entry was posted in Digital reflections on November 30, 2004 by Espen. The English economist David Ricardo (1772-1823) postulated this: If you can do X better than you can do Z, and there’s a second person who can do Z better than he can do X, but can also do both X and Z better than you can, then an economy should not encourage that second person to do both things. You and he (and society as a whole) will profit more if you each do what you do best. Let us decide, for the sake of an example, that one legal thriller is equal to one pop song as Benefits to Society. (One thriller or one song = 1 unit of BS.) John Grisham is a better writer than Courtney Love. John Grisham is also (assuming he plays the comb and wax paper or something) a better musician than Courtney Love. Say John Grisham is 100 times the writer Courtney Love is, and say he’s 10 times the musician. Then say that John Grisham can either write 100 legal thrillers in a year (I’ll bet he can) or compose 50 songs. This would mean that Courtney Love could write either 1 thriller or compose 5 songs in the same period. If John Grisham spends 50 percent of his time scribbling predictable plots and 50 percent of his time blowing into a kazoo, the result will be 50 thrillers and 25 songs for a total of 75 BS units. If Courtney Love spends 50 percent of her time annoying a word processor and 50 percent of her time making noise in a recording studio, the result will be one half-complete thriller and 2.5 songs for a total of 3 BS. The grand total Benefit to Society will be 78 units. If John Grisham spends 100 percent of his time inventing dumb adventures for two-dimensional characters and Courtney Love spends 100 percent of her time calling cats, the result will be 100 thrillers and 5 songs for a total Benefit to Society of 105 BS. David Ricardo applied the Law of Comparative Advantage to questions of foreign trade. The Japanese make better CD players than we do, and they may be able to make better pop music, but we both profit by buying our CDs from Sony and letting Courtney Love tour Japan. And if she stays there, America has a definite advantage. 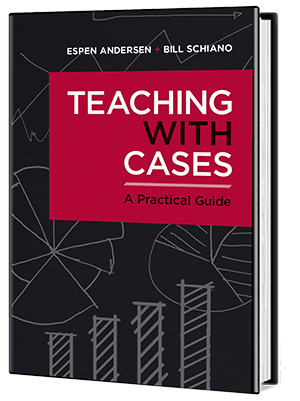 This entry was posted in Teaching on November 30, 2004 by Espen. Feeling geeky today, so here is a great list of Computer Stupidities to waste time on. My goodness, what people can get themselves into. This entry was posted in Digital reflections on November 29, 2004 by Espen. ACM Ubiquity just published an interview with me, somewhat misleadingly titled The Economics of Technology Evolution (not that there is anything wrong with that as a topic – but the interview was a little bit of everything). Anyway – if anyone has any feedback on my two “laws” of the Internet, or anything else, I will be happy to hear about it! This entry was posted in Digital reflections on November 23, 2004 by Espen. 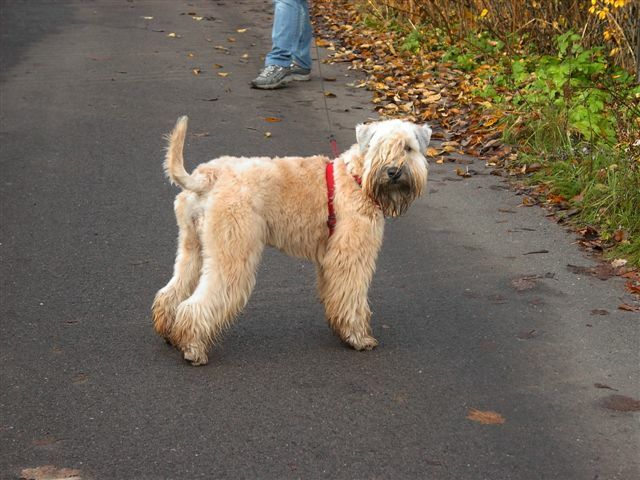 We have an Irish Softcoated Wheaten Terrier, named Midi, much loved, playful and lively and cute. The other day, my wife searched Google Images for “wheaten terrier“. Imagine her surprise when a picture of our very young wheaten terrier puppy showed up as the top image. With hindsight, it was clear why: I had posted a link to the picture in the manuscript of a speech I had given in Ireland, where I referred to our Irish-ancestored dog in the opening statement. 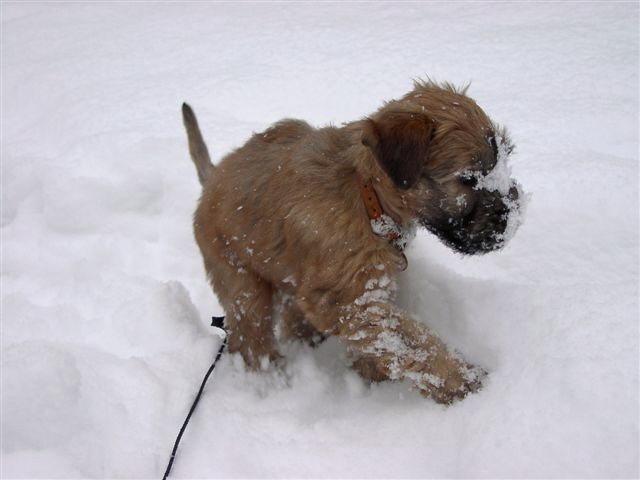 And given the interlinked nature of blogs – or, perhaps, the lack of blogging wheaten terrier breeders – the picture has escalated the list, courtesy of Google’s Page Rank algorithm, which places high emphasis on incoming links. Dogs grow, of course, and so has our Midi. To set matters straight, I have decided to post a few more pictures – “Wheaten Terrier resting“, “Wheaten Terrier on a walk” – just to see how fast they will move into the search engines. 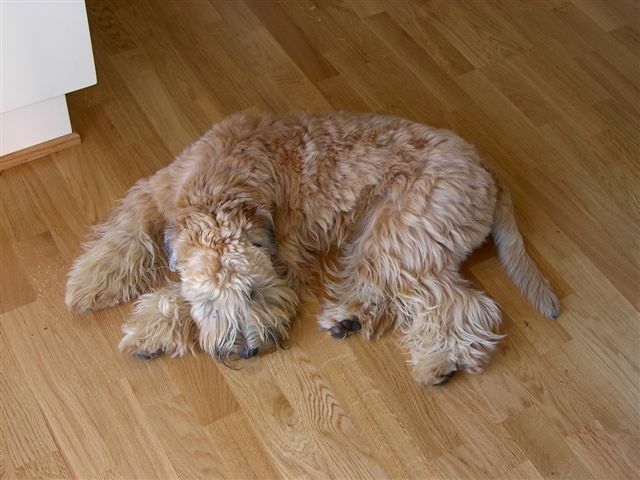 As well as provide some more typical pictures of what a Wheaten Terrier actually looks like…..
PS: Given the introduction of Google Scholar, as well as a recent paper (via Marginal Revolution) on an auction- and citation-driven market for academic publications, the interlinkedness of information attains career-enhancing importance. Now, which mutual-admiration club should I become a member of? PSPS: Sometimes Midi will show up as number two. Wonder why…. PSPSPS: Aside from their cute looks, playful nature and sunny disposition, Wheaten Terriers don’t molt. Now, there’s a great feature in a dog. This entry was posted in Digital reflections on November 19, 2004 by Espen. On December 17th, I am participating in a teleconference discussion about new technologies for The Concours Group. The idea is to ask “Which technologies do CIOs need to pay attention to – the next year, two years, five years or ten years out? I won’t go into the timing details here – but here is a list of technology evolutions that I think will happen in the near future. Anyone with other solutions? Wireless make cables obsolete, at least for the personal connection. New standards such as WIMAX, 802.11n (gigabit wireless Ethernet) and perhaps Zigbee or (finally) Bluetooth will make a serious dent in the demand for cables. Telephones will run on the Internet rather than the other way around. VoIP will marginalize the incumbent telecommunications providers, as a classic disruptive technology. DRM will have modest success in the corporate market but not in consumer space: DRM – which only will work for identifiable and small customer sets – will be used by companies who want to limit access to their corporate information, especially in an era when employees can blog and extranets are the norm. In the consumer space, however, copy protection schemes will be broken and confirmation-based algorithms – the digital equivalent of calling the CD manufacturer and ask permission everytime you play a song – will not work this time either. In fact, never. Multimedia content delivery over the net will take off. With broadband connections, cheaper digitizing technology, and content companies gradually beginning to understand that going to war on your customers is marketing myopia, delivery of content over the Internet will move from fringe to mainstream. TV stations (especially the public ones in Europe) have already started to delivering more and more of their content over the Internet. iTunes will get new competitors, and podcasting will become a serious alternative to truck-based music delivery. Webservices will disappear as buzzword and appear as common practice. Enough said. RFID will be implemented anywhere the privacy advocates can’t see it. After the outburst against RFID. it will be relegated to implementation at the case and pallet level, improving logistics further for the big retail chains. The in-store theft problem – which, incidentally, is mainly perpetrated by employees – will be solved by off-line solutions such as the Vensafe dispensing machines for small, expensive items, activated via plastic cards at the cash register. The Ipod will move from music platform to information tool. With a 60 Gb hard disk and a small screen, the iPod will be able to store not only music, but also pictures and video snippets – and will become the basic item in a portable personal architecture – connected to cellphone, camera, PDA or combinations thereof. China just might have the year of Penguin – in two years. Linux on the desktop is, I am sorry to say, a non-starter. Except, perhaps, in vertical markets (grade schools) or in China. Linux will continue to attack Microsoft from above (in servers) and below (as “device frosting” and operating system for the emerging OEM cellphone industry), but will not make much headway against the desktop for at least 3 more years. Blogs and wikis will go mainstream and corporate. Blogs and wikis and other forms of loosely coupled collaborative software will be integrated into web browsers and email clients (using RSS) and will become the new, relatively spam-free way to distribute medium-intensity information streams. An IT market for older people will open up, where companies compete on componentization and usability. Marketers will finally realize where the money is, and develop technology for the grey masses – as well as for their grandchildren, and the financial and informational interaction between the two. Countries will invest in countering digital amnesia. Fueled by continued rapid growth in search engine technology speed and functionality, microfilm- and paper-based libraries will increasingly be put online. We will have the paperless library (and perhaps the paperless toilet) long before the paperless office. The home office will become the new standard for office technology. Actually, this has already happened. Computers, printers and screens will increasingly be designed for the home office environment – and the corporate office will be designed as a bigger version of the home. This means more plug and play, more miniaturization, maintencance-free wireless and really quiet, inexpensive printers. 10 years from now, IBM will issue a press release saying that voice recognition is the technology of the future, that the next release of ViaVoice is showing real promise, and that the time to ditch the keyboard is Real Soon Now…..
Well, so far, so good – I am sure I missed a lot, any suggestions? This entry was posted in Digital reflections on November 18, 2004 by Espen.